Netanyahu again claims that Gideon Sa'ar conspired against him. Sa'ar in response: The claims are baseless. Prime Minister Binyamin Netanyahu claimed on Sunday evening that two members of the Likud party had approached him and told him about a trick that former minister Gideon Sa'ar had concocted, which would have seen President Reuven Rivlin tasking Sa’ar with the formation of the government instead of Netanyahu. 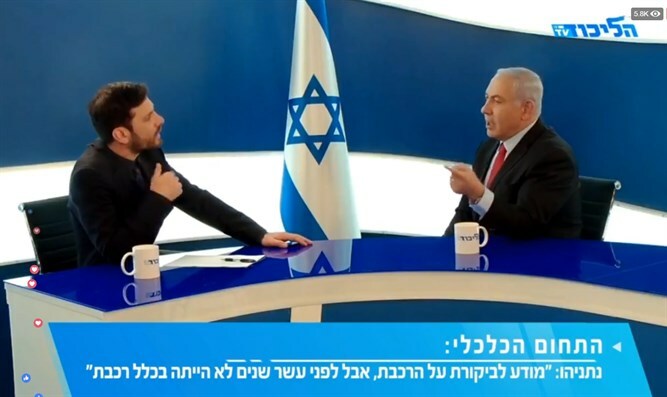 "I did not make this up, his trick will not succeed," the prime minister said in an interview with Likud TV, the newly established online television channel which Netanyahu set up to bypass the media ahead of the elections. Sources close to Netanyahu said that "Prime Minister Netanyahu is working so that Gideon Sa'ar will not lead the Likud list. Beyond that he does not interfere with the ranking of ministers and Knesset members." This is not the first time that Netanyahu has accused Sa’ar of conspiring against him. Last October, Netanyahu claimed that a former senior minister from the Likud party, meaning Sa’ar, had plotted to bring him down. "For a few weeks now, I have known that a former Likud minister is talking to coalition elements and has devised some subversive maneuver, that I will bring the Likud to a landslide victory in the elections and then ensure that I will not be prime minister against the will of the Likud voters," Netanyahu said at the time. Sa’ar later fired back, making clear that he never acted against the prime minister and adding his accusations “crossed a red line”. Sa’ar also responded to Netanyahu’s comments from Sunday in a post on Twitter. "Unfortunately, two days before the primaries, the prime minister chose to try and recycle the false plot he made up for the first time a few months ago. The goal is clear: An attempt to harm me in the primaries. Likud members are smart and know very well that these accusations are baseless. On the eve of critical elections for the Likud and the State I will act as a responsible adult: I will not be dragged into an internal war inside the house."